A fae shouldn't have to hide her power. But in the world of the Great Nightmare, magic makes me a target. It’s been eighteen months since the angels of the apocalypse ripped our world apart. Now, I'm getting the chance to fight back against the terrifyingly seductive angels. In fact, I’m going undercover as a spy in their castle. Problem is, I have to pretend to be someone I’m not: an alluring succubus. If I don't fool them, the fate of the world will lie in ruins. I can't let that happen. The angels tried to destroy my world. Now it’s my turn to unleash my powers and ravage theirs. Not sure I can summarize my thoughts fully for a quick thought section, but I feel like Shakira does a good job. The premise for Covert Fae is definitely something that intrigued me. Ruby is a fae who's caught in a apocalyptic world they call the Great Nightmare. She's luckier than most in that she has her fae powers to help her survive–she can glamour herself to look like almost anything, she's a damn good shot with a bow and arrow, and if she's in real danger her feral fae side will come out to play, fangs and claws included. Before the Great Nightmare, Ruby glamoured herself as a succubus to perform burlesque in nightclubs, under the name Angela Death. But that all came crashing down, along with Ruby's normal life, once the Angels came down from the heavens and started slaughtering humanity with the help of Dragons. Sounds like my shiznit to me! But, this book started off slower than I would've liked. One thing I dislike in novels is when the author spends the first part of the book as obvious world-building and throws the actual plot to the wayside. This usually results in a lack of any cohesive action and ends up being a mish mash of scenes that are literally only meant to show the reader what's going on in the world around the character. I felt this book did suffer from that for the first few chapters. As part of that world building, the authors also introduced us to a whole cast of characters in the beginning that, frankly, became completely irrelevant not too long after. Ruby concocts an incredibly daring plan to get captured by the angels in order to infiltrate them and spy from the inside. This begins the actual plot of the novel, and once that gets into motion it does become a really fun read. Ruby has everything I love in a heroine–she's spunky, resourceful, and strong both emotionally and physically. Reading things from her point of view was entertaining, so I'm glad about that. As for the angels, I'm holding off on judgment until the next book, because I think they've all go ulterior motives. But, I'm team Adonis if anything does go down. 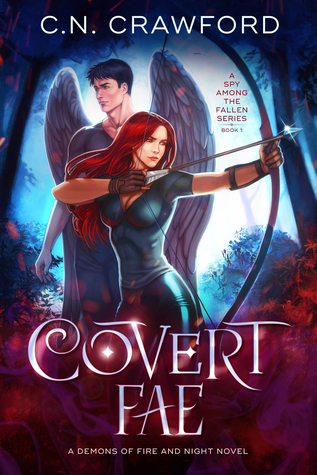 Covert Fae is available to purchase for $2.99 for a Kindle copy, and $12.99 for a paperback. Also available on Kindle Unlimited!